Inspiration for what I do is based upon an intuitive and emotional response to what I am seeing. Painting figures and portraits invigorate me and continue to be a focal point in my compositions. The people that I choose are in my life and environment; my family, my students and friends, my colleagues. Tackling larger compositions with the people sitting for me in a space or outdoors is an extraordinarily exciting prospect. I paint from life and most often complete the entire process directly in front of my subject. While I do not have any prejudice against photographic references, I value painting directly and I have found it has many benefits for me. I see more information while in front of my subject. I am inspired to change things and I have an urgency to capture what is flowing from reality. 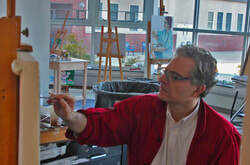 The Noyes Museum, Realism Unbound, An Exploration of Representational Painting by New Jersey Artists. The Noyes Museum, A Sense of Place.